In recent newsletters, I discussed three possible causes of night sweats: reproductive hormone deficiencies, inadequate adrenal function, and Candida overgrowth. In the last of this four-part series, I'll discuss the other common cause of night sweats: nighttime acid reflux. To protect it from stomach acid, your stomach is built like a tank. Your esophagus, on the other hand, isn't. 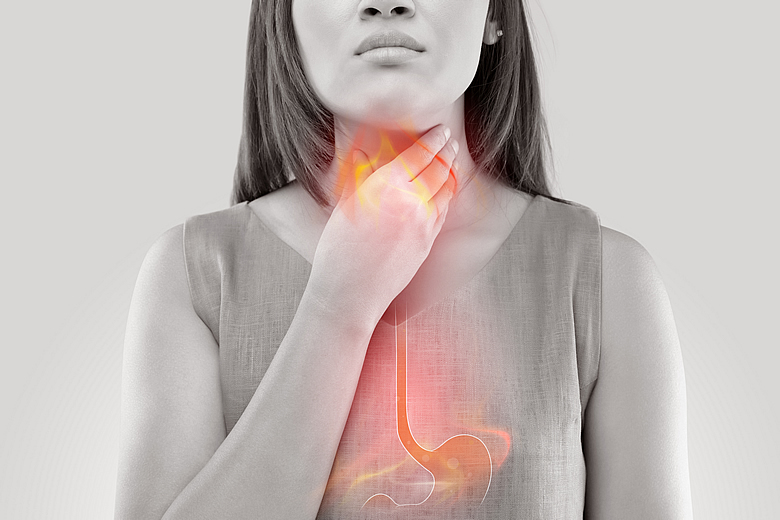 When you have acid reflux, stomach acid flows up into your unprotected esophagus, where it treats your food pipe just like another piece of meat — meaning it tries to digest it. If this occurs when you're sleeping, it can cause you to wake with sweats. Acid blockers are often used to treat reflux. Unfortunately, a growing body of research suggests that long-term use of acid blockers (such as Prilosec and Nexium) can be toxic. Zantac and Tagamet are much safer for this, but even they interfere with digestion. If you have daytime indigestion, you're very likely to also experience nighttime acid reflux. Sometimes when you wake from this, you'll be aware of your heartburn. Other times you'll inhale stomach acid while still asleep and wake up in a sweat not really knowing why. In an article I wrote, "How to Get Off Prescription Antacids, Naturally," I discussed helpful tips for getting off acid blockers naturally. (Those of you who use my free mobile app, "Cures A-Z," can bring up the "Heartburn" condition to find the same tips.) An important tip is that because acid blocker medications are so addictive, you shouldn't try to stop taking them too suddenly. If you do, a rebound acid hypersecretion effect can occur and cause you indigestion from hell. So instead of going cold turkey, follow the tips in my articles. Acid reflux, and the more severe form it can progress to called GERD (gastroesophageal reflux disease), can't properly heal until you take care of the nighttime reflux. So let's discuss how to do that! Poor digestion is epidemic in the U.S. One big reason for this is that processed-food manufacturers discovered they could prolong shelf life of their products by destroying the enzymes in food that cause the food to ripen. But this is a problem, because enzymes are also needed in order for humans to properly digest food. Without them, food simply sits in your stomach and churns. Then, after a while, your stomach hits the "return to sender" button, and you get acid reflux. Acid reflux at night occurs because gravity no longer holds the acid in your stomach when you lie down. Your body has a valve that should prevent this flow, but if it's not working, the acid flows into your esophagus. This causes irritation that will markedly amplify daytime indigestion as well. Start by taking an acid blocker medication an hour before bedtime for three to four nights. If this helps, then you've identified the problem. At this point discontinue taking the acid blocker, because (as I pointed out earlier) it's quite addictive and toxic if used long term. If you feel that you need a nighttime medication for a little while, use Tagamet or Zantac at bedtime instead. To settle daytime indigestion, and the nighttime reflux that can result, follow the instructions below. You should find that your heartburn begins to improve after about 6 weeks. Take 1/2 tsp of bicarbonate of soda (e.g., Arm and Hammer) in 4 oz of water at bedtime to neutralize the acid in your stomach (not for children under 16 years old). Though it's a bad idea to keep your stomach acid "turned off" during the day (because you need it to digest food) you don't need it while sleeping. If you have high blood pressure, use potassium bicarbonate instead (not carbonate), such as this product on Amazon. You want to be sure your food is completely digested by the time you go to bed. So don't eat within two hours before bedtime. 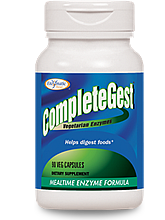 One to two hours before bedtime, take 2 caps of a plant-based digestive enzyme (such as CompleteGest). This will ensure your stomach is empty when you sleep. Sleep with your upper body elevated at least 6-8 inches so that gravity keeps the acid in your stomach. Just raising your head with pillows won't work. Instead, place 6-8" bricks or phone books under the two legs on the head end of your bed. Another wonderful solution is to use a sleep wedge pillow (you can find one online at Hammacher Schlemmer). Take 5-6 mg of an immediate release melatonin at bedtime. Research shows that this decreases reflux. 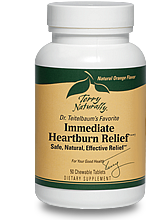 Keep a few Immediate Heartburn Relief chewable antacids at bedside to take if needed. These are more effective and much healthier than regular calcium chewables. By taking the steps I discussed in this four-part series, most people can relieve themselves of night sweats and return to having much more restful sleep!